[Nu alleen beschikbaar in het Engels] On Wednesday May 16th, we took this picture in front of the Vrankrijk, to give expression to our sadness and anger in the face of the continued violent oppression of the Palestinian people by the Israeli state. The occupation must end, the blockade of Gaza has to be lifted, refugees have the right to return. 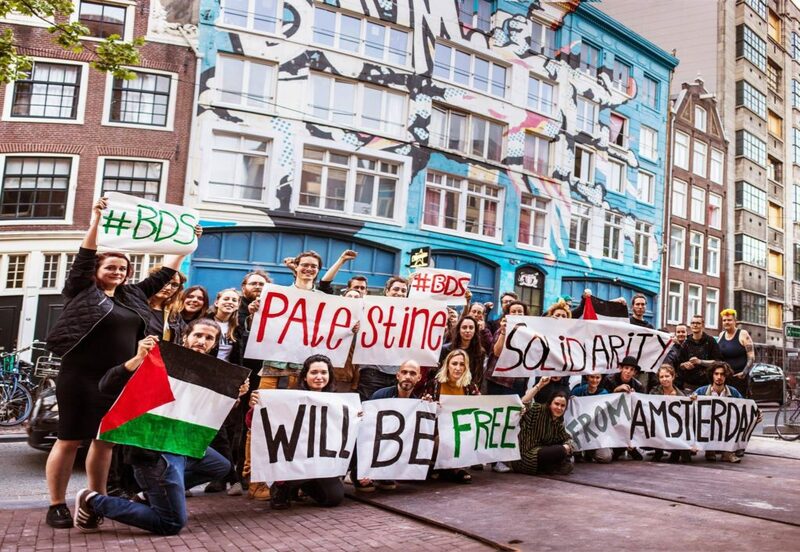 PALESTINE WILL BE FREE – Solidarity from Amsterdam! To finish this message, we would like to share this powerful poem from Palestinian American political activist Suheir Hammad, also featured in the documentary “Fourth World War”. “Occupation, curfew, settlements, closed military zone, administrative detention, siege, preventive strike, terrorist infrastructure, transfer. Their WAR destroys language. Speaks genocide with the words of a quiet technician. Occupation means that you cannot trust the OPEN SKY, or any open street near to the gates of snipers tower. It means that you cannot trust the future or have faith that the past will always be there. Occupation means you live out your live under military rule, and the constant threat of death, a quick death from a snipers bullet or a rocket attack from an M16. A crushing, suffocating death, a slow bleeding death in an ambulance stopped for hours at a checkpoint. A dark death, at a torture table in an Israeli prison: just a random arbitrary death. A cold calculated death: from a curable disease. A thousand small deaths while you watch your family dying around you. Occupation means that every day you die, and the world watches in silence. As if your death was nothing, as if you were a stone falling in the earth, water falling over water.